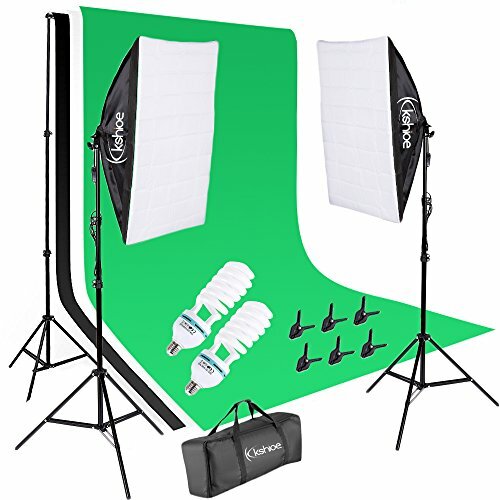 Kshioe Photo Video Studio Light Kit - Includes Studio Background Stand,Muslin Backdrops(Green Black White),Softbox,Lamp Holder And LED Bulbs,Clips by Kshioe at Come As You Arts. MPN: KS-PK3. Hurry! Limited time offer. Offer valid only while supplies last. This is a new and specialized portable photography soft box light kit . Ultra compact design makes this kit the best choice when space is limited. This is a new and specialized portable photography soft box light kit . Ultra compact design makes this kit the best choice when space is limited. This studio lighting kit with backdrop is perfect for advertising products, fashion shots, video recording and more. Due to its ideal set-up you can easily use photography studio lights in home and studio. Once getting a studio light kit for photography you can get rid of unflattering shadows forever. UPDATED SOFT BOX: photography soft boxes are made of high quality nylon, ultimate soften light stream and remove shadow to make perfect shooting. Special designed white front cover closes the front of the soft box, making varied lighting options quick and easy. Extra long cords(2.5M) help you move them freely to position it for best lighting effects. PORTABLE STUDIO LIGHT KIT FOR PHOTOGRAPHY : For simple storage and transport,the stand collapses easily and set up in minutes to offer you a professional photo studio. You could always pack it all up and use it as a travel set with our carrying bag. STANDARD PHOTO STUDIO LIGHT KIT : portable photography soft box light kit for video includes [2x] softboxes, [2x] light bulbs, [2x] tripod stands, [3x] Background Backdrop(Black White Green Backdrop), [3x] 2*3m Light background Stand, [6x] black fish mouth clamps and a portable carrying bag. Our fan-favorite 18-month warranty and friendly customer service.